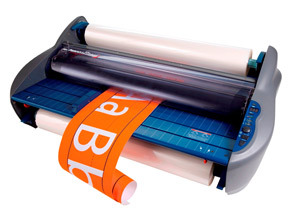 GBC Roll and Pouch Laminators can protect and enhance your documents and important papers from spills and wear tear. These laminators are a great way to laminate ID's, badges, letter and legal documents, menus, charts, banners and more. The GBC laminators are designed for quality laminations. The Roll Laminators are designed for high speed applications. The Pouch Laminators provide quality laminations right at your desktop. We carry a wide selection of laminators. Great For Laminating Letter and Legal Size Documents Quickly And Easily. 3 mil Thickness. Auto-Shut off after 4 hours and a Built in Sliding Trimmer. 4-Roller Design With 2 Heated Rollers. 6 Speed Settings, Cooling Fans and an Anti Jam Reverse System.